Dodged between a heartbreak and a smoke break, Kathy Heideman's Move With Love wandered off I-5 somewhere just south of Hungry Valley State Vehicular Recreation Area and broke down. At its dusty roadside, cheap truck-stop java flows over plaintive coffeehouse tunes concerning "Bob" and "Need." Her session hand's lanky, echo-laden guitar might've twanged a bit strong for the typical sandal-shoed hitchhiker, who'd have fell harder for Dylanesque grandeur on "The Earth Won't Hold Me." More Bakersfield than Laurel Canyon, and set to walking in 1976 by the one-off Dia imprint in a plain-Jane, black-on-white sleeve, Heideman's lone LP suffered the geographical misfortune of having ripened in the presilicon orchards of San Jose, California, far from more marketable realms-Emmylou's backyard, say, or Joni Mitchell's summery lawn. 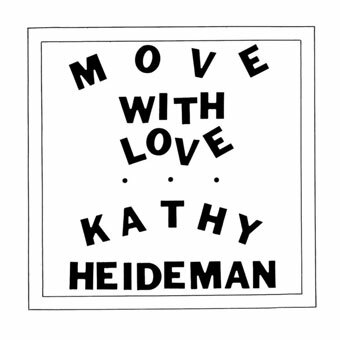 Heideman herself faded out thereafter, packing her shaken, singular voice into a rustic suitcase, moseying on, and leaping into the moving sun.